Found 2 file extension associations related to File Decryptor and 2 file formats developed specifically for use with File Decryptor. 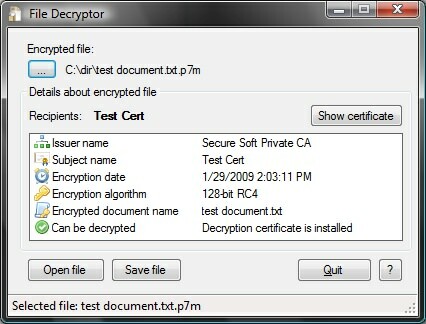 File Decryptor (P7M and P7E file extension) lets you view files encrypted by File Encryptor or other encryption software that uses digital certificates for encryption operation. The File Decryptor software seems to be old or discontinued. If you need more information please contact the developers of File Decryptor (SC Secure Soft SRL), or check out their product website.